James Bond finds a good friend and ally in the Head of Station T in Istanbul. Darko Kerim is is the product of a Turkish father and English mother and, according to M, “One of the best men we’ve got anywhere. Does a wonderful job”. Kerim is two inches taller than Bond with a face that is “vaguely gipsy-like” and with a large build thanks to training to be a professional strong man. Working as a corporal for the Ministry of State Security (MGB) in Moscow, Tatiana Romanova is chosen by Rosa Klebb for an operation to discredit the British Secret Service. Claiming to have fallen in love with an archive photo of Bond, her story is that she wants to defect to the West. To clinch it for the Secret Service she plans on bringing the Russian’s Spektor code machine with her. 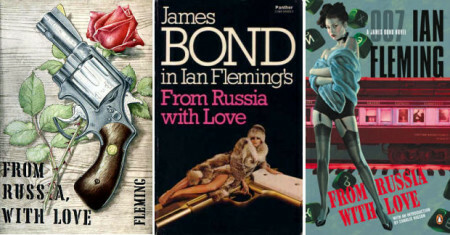 Although working for Rosa Klebb and SMERSH, she does genuinely fall for Bond – and vice versa – and looks forward to her time with Bond and a new life in the West. The head of a gang of gipsies, Vavra, is one of Kerim’s best sources. When Bond meets him Vavra wears Macedonian dress, a “white shirt with full sleeves, baggy trousers and laced soft leather top-boots”. He also carries a short curved dagger in a leather scabbard. Before departing Vavra tells them that Kerim should beware of “a son of the snows” while Bond should watch out for “a man who is owned by the moon”. One of Kerim’s numerous sons, known to all as “Tempo”, is based in Belgrade. He collects Bond and Tania from the Orient Express to take them back to his apartment for food and drink. But first Bond must tell him the news of his father. Klebb worked as a double agent in the Spanish Civil War and worked her way through SMERSH to become its Head of Operations. She is described as being in her late forties, short and squat with dumpy arms and a short neck and thinning orange hair scraped back into a bun. Although she is in the background throughout the operation, Bond finally meets her at the Hilton in Paris when she has a few tricks up her sleeve. Red Grant is an Irish psychopath whose murderous tendencies peak during the full moon. Starting out by killing animals he soon progressed to people. Posted in West Berlin after the war, Grant defected to the East where SMERSH trained him as an assassin. Rising through the ranks, Grant is now SMERSH’s Chief Executioner. He introduces himself to Bond as Captain Nash, the local secret service man in Trieste. The head of the “Faceless Ones” is a Bulgarian “refugee” ordered by the Russians to kill Kerim, which he attempts with a bomb. Later Krilencu and his gang try to kill Vavra and his men in an attack on their gipsy camp. The attack forces Kerim to retaliate. After Kerim arranges for two Russian agents to be removed from the Orient Express, only Benz remains. Travelling on a German passport, he avoids the restaurant car. Instead he spends most of his time in his sleeping compartment and buys sandwiches and beer at the stations at which they stop.